Running back Dalvin Cook didn’t play in Week 3 when the Vikings lost to the Bills, but he’s expected to suit up tonight, according to Ian Rapoport of NFL.com (Twitter link). Cook is dealing with a hamstring injury, and Minnesota coaches plan to use caution by examining his during pre-game warmups. After taking part in today’s walkthrough, Cook will be on a pitch count against the Rams. That means backup Latavius Murray, who filled in for Cook last week, could see work against Los Angeles’ vaunted defensive line. Cook, of course, suffered a torn ACL and missed the majority of his rookie campaign in 2017, but did average 4.8 yards per carry before going down. Cook isn’t the only injured player who will be active for tonight’s contest, as Rams cornerback Marcus Peters will be avaialable despite reports he would miss time with a calf strain, tweets Steve Wyche of NFL.com. Peters was expected to miss two-to-four weeks, a devastating loss especially given that fellow Los Angeles defensive back Aqib Talib was placed on injured reserve earlier this week. Instead, Peters will take the field, giving the Rams at least some hope of stopping Vikings wideouts Stefon Diggs and Adam Thielen. Like Cook, Peters could conceivably be on a snap limit, meaning Los Angeles will need to count on reserves like Sam Shields and Troy Hill. After a bizarre weekend, Vikings defensive end Everson Griffen will unsurprisingly be inactive for tonight’s game. He spent today finishing a mental health evaluation, per Tom Pelissero of NFL.com (Twitter link), who adds Griffen is expected to speak publicly about his situation in the near future. Police were called to Minneapolis hotel Saturday following reports Griffen was threatening to assault staff members, and Griffen later reportedly behaved erratically outside teammate Trae Waynes‘ home. Aqib Talib is expected to miss around a month of action because of a high ankle sprain suffered in the Rams’ win over the Chargers. However, this process will now include a surgery. Sean McVay confirmed Talib will have surgery on Thursday (per The Athletic’s Vincent Bonsignore, on Twitter). He’s been declared out for Thursday’s game against the Vikings, and McVay isn’t sure how long it will take Talib to recover from this operation, per Lindsey Thiry of ESPN.com (via Twitter). An IR stay for the 11th-year defender hasn’t yet been mentioned. The Rams are set to face the Vikings in a key NFC game Thursday and may not have either Talib or Marcus Peters for it. Peters is battling a calf strain and is day-to-day, per McVay. This will be a blow to a Rams team flush with star talent on defense. Nickell Robey-Coleman and Sam Shields represent the next men up, but Robey-Coleman serves as Los Angeles’ slot corner. Shields missed all but one game during the 2016 and ’17 seasons due to severe concussion trouble. He’s played in 48 snaps across three Rams games this season, however. The former Packers top corner is still just 30. 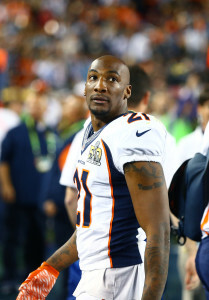 Talib has not missed more than three games in a season since his 2012 campaign with the Buccaneers and Patriots. He missed three games for the 2016 Broncos but still earned his first-team All-Pro honor. He missed one game last season, but that was for his fight with Michael Crabtree. Following their home Vikings tilt, the Rams have road trips scheduled for Seattle, Denver and San Francisco. It appears unlikely Talib will be healthy enough to face the Broncos in Week 6. Rams cornerback Marcus Peters is believed to have suffered a calf strain that could sideline him for two to four weeks, Ian Rapoport of NFL.com (on Twitter) hears. The good news is that the initial tests show no structural damage, so it shouldn’t be a long-term absence for the standout corner. The Rams acquired Peters from the Chiefs this offseason in exchange for second and fourth-round picks. In terms of talent, Peters is one of the league’s very best young cornerbacks, but Kansas City grew tired of the headaches. The Rams, so far, have been treated to the good side of the 25-year-old. Peters nabbed a pick six in the team’s Week 1 win over the Raiders and has graded out as a top-30 cornerback through three weeks, according to Pro Football Focus. Veteran Sam Shields saw 37 snaps on Sunday and wound up leading all L.A. corners in that area as Peters and Aqib Talib (ankle injury) were forced out of action. Shields is a good bet to move into the starting lineup, but the Rams may also need to bolster their cornerback group with an outside addition. Some fifth-year option decisions are easier than others. On Tuesday, the Rams finalized a couple of no-brainer calls. The Rams will exercise their fifth-year options on running back Todd Gurley and cornerback Marcus Peters, according to NFL.com’s Ian Rapoport (on Twitter). Gurley, the No. 10 overall pick in the 2015 draft, set new career highs in 2017 as he ran for 1,305 yards with a league-leading 13 rushing touchdowns. He also set new personal watermarks with 64 catches and 788 yards with six receiving TDs. The decision to keep him under contract for 2019 was an easy one, but the eventual discussions on a new long-term deal could be tricky. 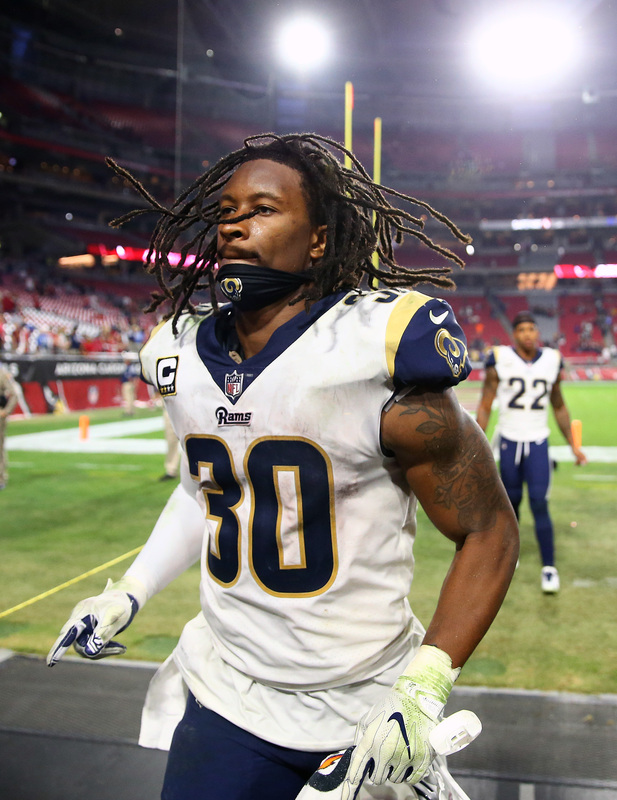 The Rams will have to address the contracts of several other key players – including Peters and defensive tackle Aaron Donald – and Gurley will command a whopping asking price, particularly if Steelers star Le’Veon Bell secures the mammoth contract he is seeking. The Rams acquired Peters in February from the Chiefs in February in exchange for second- and fourth-round draft picks. Peters is one of the most talented young cornerbacks in the NFL, but a personality clash led to his exit from KC. The Rams, presumably, will want to see how Peters meshes with the coaching staff before discussing a long-term contract. For now, the Rams have Peters under contract through 2019 with the option to bail for any non-injury reason. As shown on PFR’s 2019 fifth-year option tracker, Gurley is set to earn $9.630MM in 2019 while Peters is slated to make $9.069MM. It’s been a wild ride for the Seahawks defense the past week. After the team traded Michael Bennett to the Eagles and released Richard Sherman, it also decided to release cornerback DeShawn Shead. This was noteworthy because the Seahawks told the player it would release him to allow him to become an unrestricted free agent despite the NFL saying his contract should toll for 2018. Earlier today, Shead signed with the Lions but reportedly wanted a return to the Seahawks, the Seattle Times’ Bob Condotta tweets. After Seattle honored its statement to make the cornerback a free agent, Shead wanted to give Seattle every chance to keep him, but the organization ultimately wouldn’t match the offer he received from the Lions. Seattle now enters free agency without three of its top veterans and could be seeing the end of the Earl Thomas era, who has threatened to hold out if he doesn’t receive a new deal. The Seahawks could deal him this offseason and are reportedly looking for a first-round pick in return. Needless to say, the Seahawks once-stingy defensive unit will look plenty different in 2018. 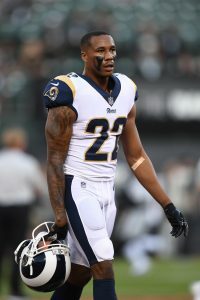 Rams general manager Les Snead said on Wednesday the team traded linebacker Alec Ogletree to accommodate the ensuing move for cornerback Aqib Talib, Alden Gonzalez tweets. Defensive coordinator Wade Phillips prefers cornerbacks to linebackers in his scheme, and a big move had to be made to bring in the former Broncos corner, who will count $11 MM toward the cap. Snead also said he sees ways the Rams can address run defense and the pass rush in free agency, Gonzalez tweets. Though he is weighing what will be available to fill those holes with rookies, he doesn’t want to just wait until the draft to fill obvious needs. The team received some insurance for its pass rush on Wednesday when it re-signed veteran linebacker Connor Barwin. New Titans cornerback Malcolm Butler said he was worried his Super Bowl benching would hurt his value on the open market, USA Today’s Lindsay Jones tweets. Butler notoriously didn’t see the field against the Eagles in February when the Patriots allowed Nick Foles to shred their secondary. The 2015 Pro Bowl selection reached a deal with the Titans on Wednesday worth up to $61 MM over five years, with $30 MM of that being guaranteed. Chiefs general manager Brett Veach said cornerback Marcus Peters‘ trade to the Rams had nothing to do with national anthem protests, Pro Football Talk passes along. “This was a football decision. … This wasn’t just one game, wasn’t a month, this was three years of body of work, and we look for consistency. We felt that this was in the best interest of the team,” Veach said. Veach also touched on the Chiefs move for Sammy Watkins, saying the team pounced on the receiver in the first minute of free agency, the NFL Network’s James Palmer tweets. Veach said that if Watkins received a call before theirs, the other team would’ve had to call in 30 seconds before they did. 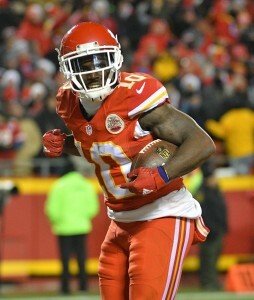 The team was motivated to move on Watkins to add him to Tyreek Hill, giving strong-armed quarterback Patrick Mahomes a pair of dynamic, stretch-the-field receivers. New Rams cornerback Marcus Peters appeared on NFL Network (Facebook link) to make his first comments since the big trade from Kansas City. When asked about whether he agrees with the Chiefs’ decision to trade Alex Smith earlier in the offseason, he did not mince words. Of course, the Chiefs’ trade of Smith was less of a referendum on his talent and more of a vote of confidence for rising sophomore Patrick Mahomes. Between the trades of Smith and Peters, the Chiefs are armed with additional flexibility and draft capital this offseason, making them one of the most interesting teams to keep an eye on. The Chiefs called every team in the league about Peters and 28 teams either passed or did not make an offer of value, Peter King of The MMQB reports. One unknown team offered a mid-round pick (King guesses that it was the Browns or Colts) and only the Rams and Niners were in on him at the end. The Rams’ offer of second- and fourth-round picks, with a sixth-round choice going from KC to L.A., was apparently better than San Francisco’s. Bill Barnwell of ESPN.com (Twitter link) gives the Chiefs a C grade for their end of the trade. Even without devaluing the 2019 second-round pick for time, Barnwell can’t wrap his head around that return for a young former All-Pro. Meanwhile, he gives the Rams a B+ for scoring a major bargain, despite Peters’ red flags. The Chiefs will part ways with safety Ron Parker this offseason. 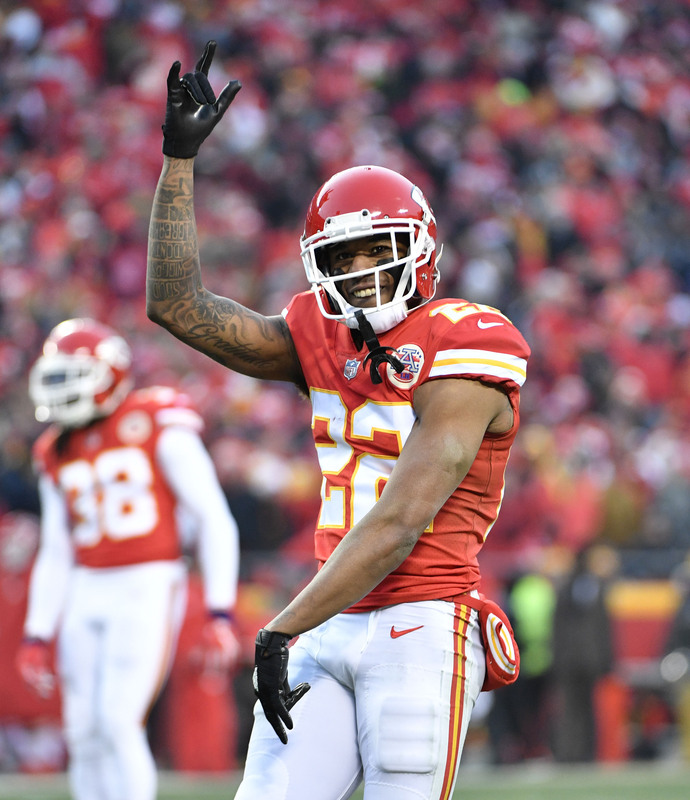 If the Chiefs’ return for Marcus Peters seemed underwhelming, that’s because there was not a booming market for the cornerback’s services. The Browns and Colts were never major players for Peters, according to Ian Rapoport of NFL.com (Twitter link), despite both teams having execs that were involved in drafting him. Shortly after Peters was shipped to the Rams, there were conflicting reports regarding the Browns’ involvement. It seems that we have a better understanding of Cleveland’s participation now – the Browns explored a possible Peters deal, but they were never serious suitors. The Colts, meanwhile, will be on the lookout for a cornerback, particularly if they do not re-sign Rashaan Melvin. However, they are armed with $74MM+ in cap space and are near the top of the draft order this year, so they have other ways to bolster the CB group. Peters would have given the Colts a top-end starter in the secondary, but he may come with headaches and the price to get him was apparently still too steep for GM Chris Ballard‘s liking. On Monday afternoon, we learned that the Rams are sending a 2018 fourth-round pick (No. 124 overall) and a 2019 second-rounder to the Chiefs in exchange for Peters and KC’s sixth-round choice (No. 196). That’s probably less than the Chiefs expected to receive, but they did not like the odds of getting Peters’ behavior under control and were uncomfortable with the prospect of giving him major dollars beyond his 2019 option. The Rams will send two draft choices to the Chiefs for Marcus Peters, Ian Rapoport of NFL.com reports (on Twitter). Neither of those selections will come in the first round, but the Chiefs will nab a second-round pick from the Rams. Rapoport reports Kansas City will receive Los Angeles’ 2018 fourth-round pick and its 2019 second-rounder for Peters. Adam Schefter of ESPN.com reports (on Twitter) the Chiefs will also send a sixth-round pick in this year’s draft to the Rams along with Peters in this swap. The Chiefs were asking for a third-round pick and a player — like they received from the Redskins for Alex Smith — but ended up receiving this package from the Rams, per Albert Breer of SI.com (Twitter link). Robert Quinn‘s name came up during the talks. Although the Rams will be getting a high-ceiling player whose rookie contract — via the team picking up Peters’ 2019 option — has two years left, only they and the 49ers were confirmed suitors. Matt Miller of Bleacher Report tweets an NFC personnel exec notes the return wasn’t as high as could be expected for a player of Peters’ caliber because of the low number of teams bidding. By trading two of their best players, the Chiefs have now added third- and fourth-round picks in this year’s draft. This will help in a year in which they do not own a first-round choice. They acquired a third-rounder in the Smith deal. The Rams do not have a 2018 second-rounder, having sent it to the Bills for Sammy Watkins last August (they collected a sixth-round choice in that deal as well). They now do not have a 2019 Round 2 choice but are in line to employ a cornerback who landed on the All-Pro first team in 2016. 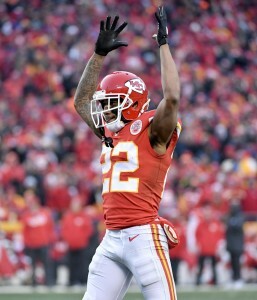 Peters was the first Chiefs cornerback since Albert Lewis in 1990 to be named a first-team All-Pro. The Chiefs selected Peters with the No. 18 pick in the 2015 draft, and he went on to become the NFL’s defensive rookie of the year. He’s been a polarizing player, having clashed with Kansas City’s coaching staff and with a sect of the Chiefs’ fanbase due to being part of the racial inequality protest, but has created takeaways at a historic rate. Peters has 19 interceptions, five forced fumbles and five fumble recoveries in three seasons. The Chiefs were leery about paying Peters as a top-market corner, and that responsibility will now fall on the Rams. Los Angeles, though, will be getting a top-tier corner and have him under team control at rates of $3.1MM (2018) and at around $9MM (2019).